Nothing says summer like the beauty of a wide open field of sunflowers! VonThun Farms Sunflower Trail is located in scenic Washington Twp., Warren County NJ. Although some farms have sunflower mazes, we have a trail that’s carved into our sunflower field. Be sure to call for availability, as Mother Nature dictates our actual open dates. 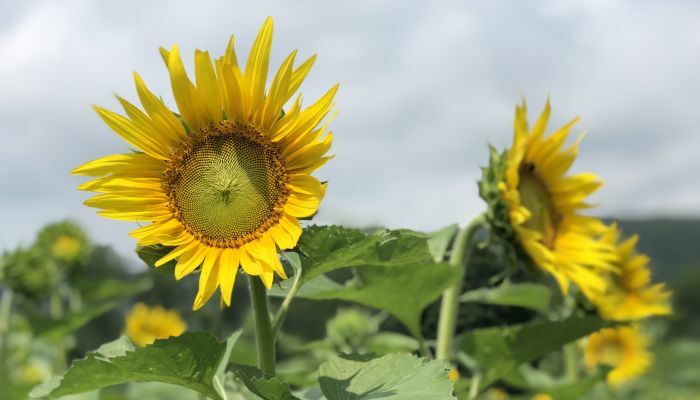 The sunflower field is beautiful in prime time … with sunflowers that are open, sunflowers that are starting to open, and sunflowers that haven’t even thought about opening yet! Bring the kids, and plan to make the Sunflower Trail your summer photo op destination! The field is beautiful and the views are amazing. We hope to have the Sunflower Trail open for 2-3 weeks, but that will depend on the weather. Cut your own sunflowers will be available, as well as pre-cut sunflowers. These dates are tentative. Dates will be confirmed once the sunflowers are planted and start to grow. The Sunflower Trail is offered at our Washington location only. View our Sunflower Trail blog post.